The Book is in Bookstores! 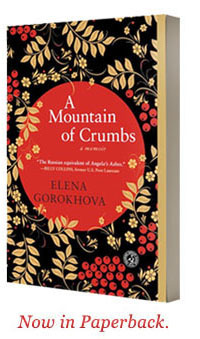 I am thrilled to announce that A Mountain of Crumbs is on the bookshelves of your favorite bookstore (as well as on Amazon) – a day ahead of schedule. Tune in to WNYC radio (820 AM or 93.9 FM) at 1 p.m. on Wednesday, January 13, for my live interview with Leonard Lopate, or listen to the taped interviews with Joe Donahue of The Roundtable (WAMC/NPR, Tuesday, January 19, 9 a.m.) and Marjorie Kehe of the Christian Science Monitor (forthcoming January issue, podcast). If I were back in Russia, it would make me reach for a jar with strawberry jam (those wild strawberries we picked in the woods – tiny berries that filled the kitchen with sweet, foresty fragrance). But here, in America, I am reaching for a packet of black currant tea and a bottle of honey, those comforting tastes that remind me of home. And, to be honest, I’m also reaching for a bottle of red Bordeaux (not Russian, for sure, but something that complements Russian food). And, to be completely honest, I’m reaching for a shotglass of vodka – to be chased with that piece of herring no one wanted left over from the Herring-Under-a-Fur-Coat recipe.